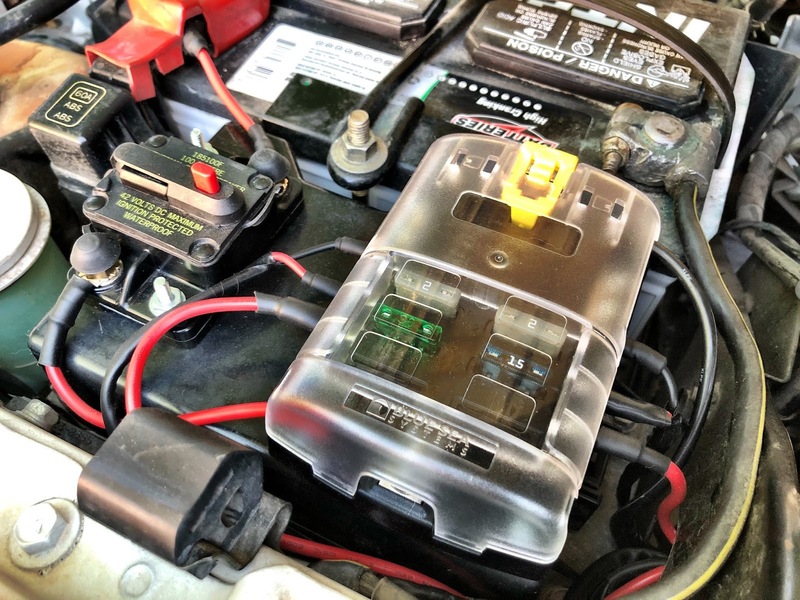 Blue Sea Systems make a variety of marine and automotive application 12v fuse blocks. The ST Blade box comes in 6 and 12 circuits with or without a negative bus. I won’t be adding many accessories so I opted for the six circuit ST Blade with the negative bus to make grounding something I won’t have to troubleshoot. I drilled two 5/8ths holes through the firewall just above and to the driver’s side of the master cylinder and lined both with heavy-duty grommets. Leads for switches and the circuit for the top lights were passed through. 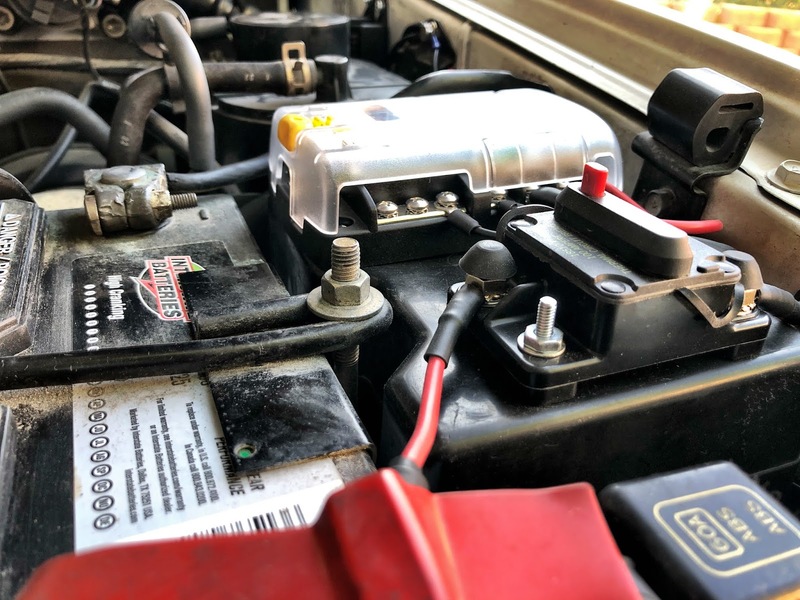 I used two Lamphus Cruiser 40A relay/wiring harnesses for the install, modifying both to connect to the fuse box, eliminating the inline fuse. All exposed wiring was insulated in heat shrink tubing. 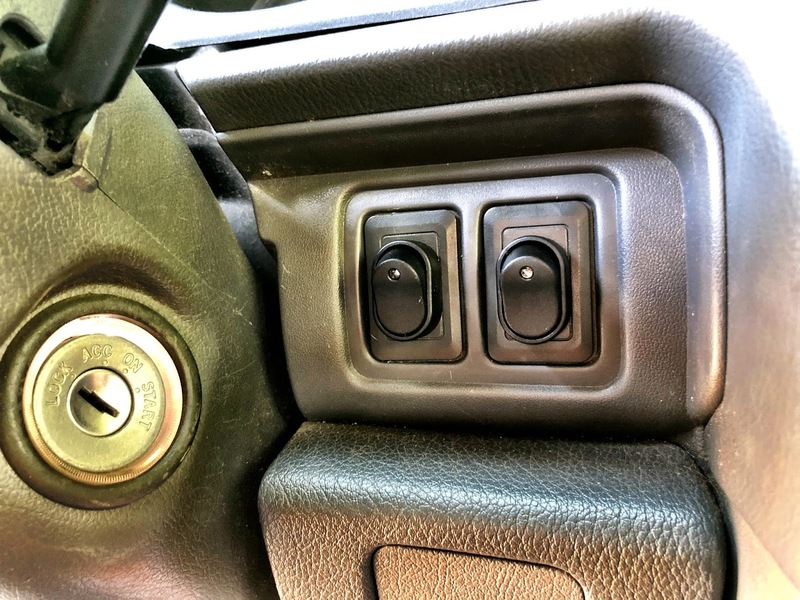 The switches are mounted on the blanks to the right of the steering column. I’ve used Daystar rocker switches on a previous install, but the factory blanks are too small to accommodate them on this one, so I went with a more generic rocker switch shipped with the harnesses. The factory blanks have plastic tabs on the back side that need to be trimmed before drilling the 7/16ths holes for the switches. They illuminate when in the on position, but are a bit too bright. At night the whole front seat is awash in blue light when the switches are on. 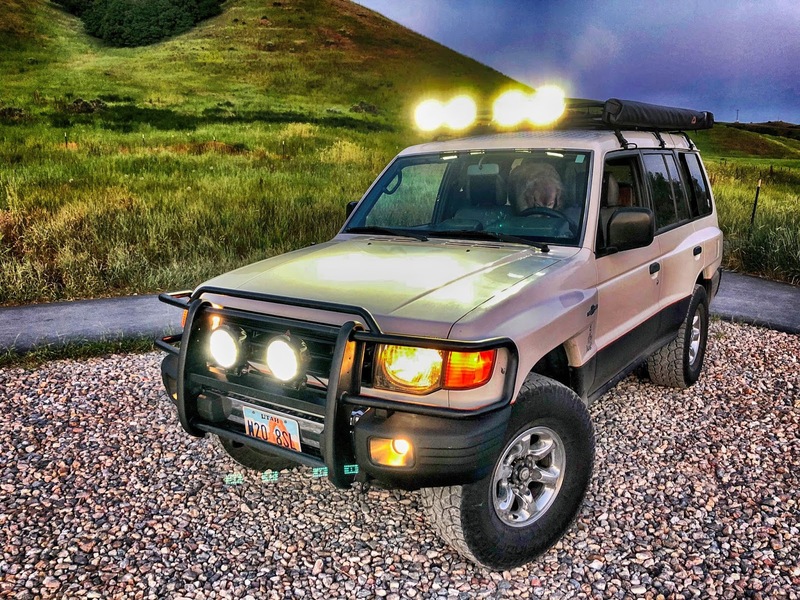 The two bull bar mounted fixtures are 80w Auxbeam 7″ spot/flood combination driving lights. 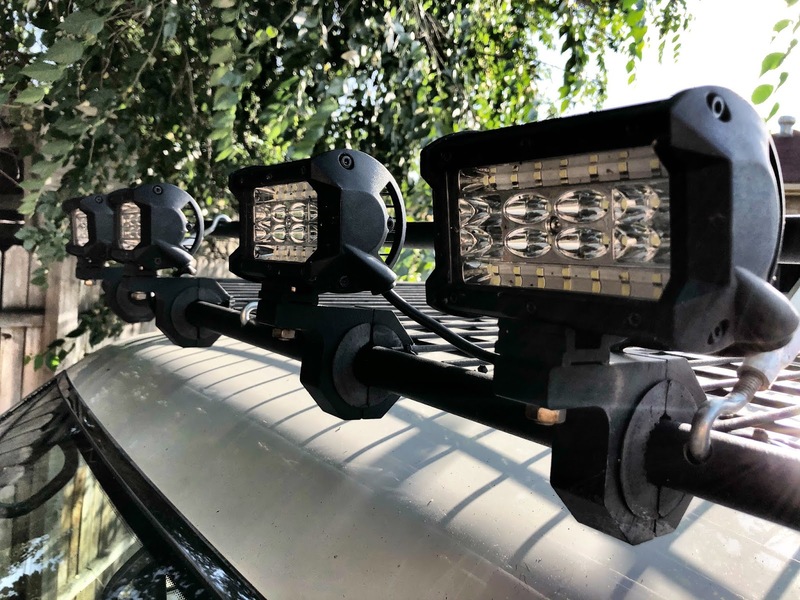 The four top mounted fixtures are 40w AKD 5″ spot/flood combination trail lights mounted on Lamphus Cruiser bar clamps. The leads are ran from the firewall, behind the dead pedal, under the door trim and up the B-pillar through the moulding. They transition out the top back corner of the driver’s door to the rack. I’ve had these top fixtures mounted since last Fall and should’ve known better to replace the cheap mounting hardware with stainless. On the list. The rubber inserts on the bar clamps aren’t wearing well either. 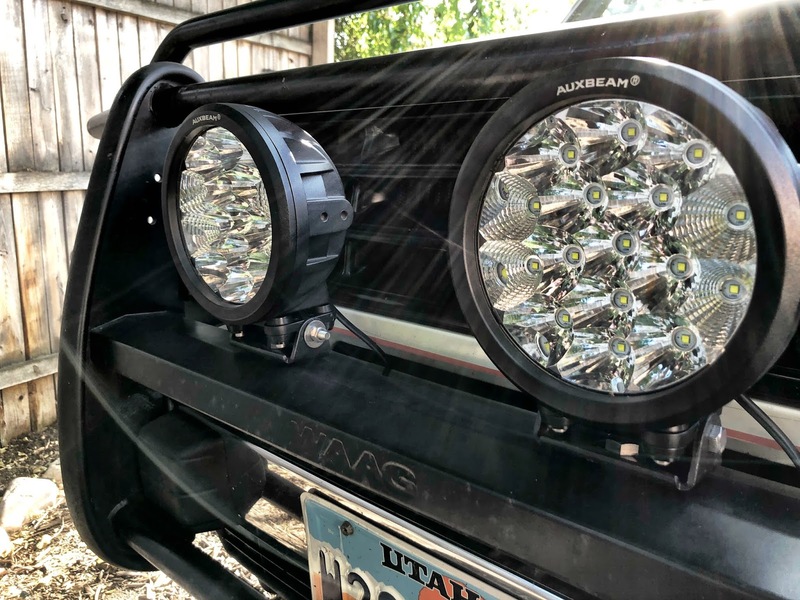 The light output far exceeds my expectations. I’ll post beam patterns soon.